Stampin'Up has an exclusive product line called the Snowflake Showcase which includes 2 stamp sets, the snowfall framelit dies, snowflake trinkets and white velvet paper. These products are available if you have a demo number and customers can get these products on Nov 1. Can't wait? Purchase the starter kit for $135.00 and choose these products as part of your starter kit. You can choose up to $165.00 in product and get free shipping and Gst. 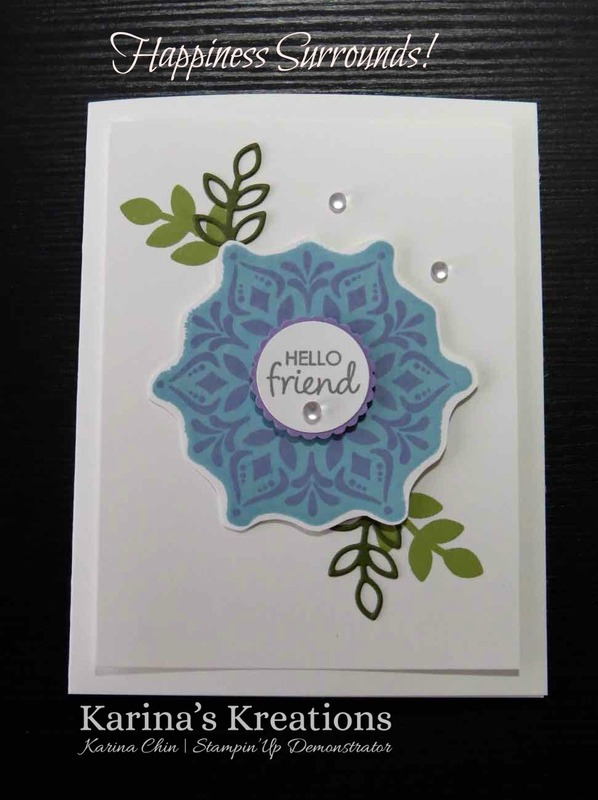 I made this beautiful card using the Happiness Surrounds stamp set. I used the stamparatus to stamp my card. I inked up the same stamp multiple times and stamped on Whisper White card stock giving the stamped image avery vibrant look. The center image was created by turning the stamp backwards and stamp ing with Balmy Blue ink.